Being a foodie can be annoying. Not to you, but to others. There's always the latest fad. Organically home grown locally sourced this or that can be tedious to find. Believe it or not, I tend to be on the trailing edge of all of that stuff. When I find something that I like, I sharpen my own skills until I get it "perfect" then I simply set the way I do it in stone and won't change unless there's a very strong reason not to. The coffee is one of those things. While Home Roasting your own beans may sound horribly exotic, and also horribly boring or perhaps strange to many people, that's how it was done for centuries. Skillet on the stove heated just so. In my case it's a popcorn popper. Since I have a popcorn popper I may as well keep popcorn in the house. But air popped popcorn in my "coffee roaster" popcorn popper doesn't taste like popcorn. It tastes like styrofoam. There's a reason why you can legally use popcorn in the US for packing peanuts. If you pop it with air, it's pretty much harmless and simply takes up space. I may try that next "shipping season" if I run low on bubble wrap. 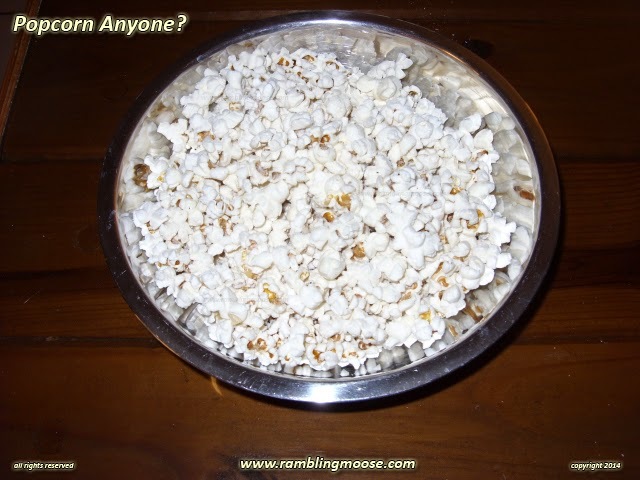 It's much more ecologically friendly, and if you simply pack the popcorn in plastic bags, it gives the people you sent it to a nice snack when they're opening the box. But it still tastes like air popped packing peanuts. Or popcorn. So how to improve that for when you are sitting in front of the one eyed babysitter having your brain drilled empty? I tried Olive Oil which was nice, but heavy. It also tasted like a pizza when I tossed on some "Italian Seasoning" mix of oregano, rosemary, and other "stuff". Nah, I will leave the pizza for when I want a pizza. We found a "Funyun" spice mix which ended up being 2 parts Onion Powder and 1 part Garlic Salt. Not too exciting, it wasn't quite right. I got into a long food conversation arc with my buddy in Atlanta who insisted that the thing was to go out and get some Coconut Oil. "Was this the latest food fad? Isn't Coconut Oil supposed to be horrible for you?" Yes, it's the latest Foodie Fad. It is supposed to be the latest wonderful thing that will save you from rack and ruin, and it even will make Julienne Fries! Sure if you can figure out how to cut those potatoes without slashing your fingers. So we bought the stuff and it sat in the cupboard for a while. I wanted a snack. Had had quite enough of the run of the mill chocolate and other junk food we get in bulk from the warehouse stores. I was thinking about making popcorn, but since Kevin was home he would want some too. Having a well prepared kitchen helps, even if the kitchen is a bit small. Galley Kitchen with one 6'4" man trying to cook up a snack can be claustrophobic. I bent my own bulk down to the floor, never the best place for a tall man. Looking for the large pot to make this stuff in, I realized I had something much better. Not only one but two Woks. Yes, I actually have two Woks. You don't? How on Earth do you stirfry? Sheesh! But seriously, I have two, and I'm glad I did. It was gift way back in the mid 80s and I have kept it since then. Looking around in the cabinets, I was trying to find the right oil. I hit upon the white plastic jar of that coconut oil. It's a thick mess of stuff, looking waxy with a layer of thick glop solidified on the top. But while it was heavier in calories, I could use much less. You know the old school recipe of a tablespoon to the pot with a quarter cup of popcorn kernels in a heavy domed lid? I could use less. It turned out that Coconut Oil has an added benefit. You don't need as much to fry. In fact, since I was using a Wok, I used a teaspoon instead and that was too much. Next time 1/2 teaspoon coconut oil to 1/3 cup of kernels. It also has a lower smoke point so I had to turn down the heat. Probably better to fry fish in. I may have to try my hand at that. There I was. In my little crackerbox galley kitchen. Using weird oils in a wok to make popcorn. At least I would be able to make enough for three. Two for me, one for you. I did say I was tall, right? We just need more. It's part of the territory. The thing is that this was some of the best popcorn I had had in a very long time. Coconut Oil is what they use in movie theaters, and since I wasn't using "The Cheap Stuff" I was able to use only a little of it, and none of that weird "Flavoring" which I suspect really is nothing more than industrial solvents and something drained from the crankcase of a 12 year old Buick. Since it was for the both of us, I made a small bowl for Kevin so he could salt or season it to his liking. I had the rest for myself. A vat of popcorn, some old reruns of Sabrina the Teenaged Witch and Petticoat Junction, and pleasant company. A real nice way to run out an evening. Pass the Kettle Corn salt, I'm thinking salty and sweet tonight!